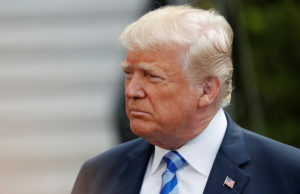 WASHINGTON — President Donald Trump is again playing loose with the facts, claiming a drop in illegal border crossings that no longer exists while blasting a source in a news story who does. Among other questionable claims in the past week, he also said he’s provided the first big military pay increase in a decade and had “finally” delivered on improved care for veterans. TRUMP, on a possible summit with North Korea: “The Failing @nytimes quotes ‘a senior White House official,’ who doesn’t exist, as saying ‘even if the meeting were reinstated, holding it on June 12 would be impossible, given the lack of time and the amount of planning needed.’ WRONG AGAIN! Use real people, not phony sources.” — tweet Saturday. TRUMP: “This whole Russia Probe is Rigged. Just an excuse as to why the Dems and Crooked Hillary lost the Election and States that haven’t been lost in decades. 13 Angry Democrats, and all Dems if you include the people who worked for Obama for 8 years. #SPYGATE & CONFLICTS OF INTEREST!” — tweet Saturday. TRUMP: “Who’s going to give back the young and beautiful lives (and others) that have been devastated and destroyed by the phony Russia Collusion Witch Hunt? …”— tweet Saturday. TRUMP: “Why didn’t the 13 Angry Democrats investigate the campaign of Crooked Hillary Clinton, many crimes, much Collusion with Russia? Why didn’t the FBI take the Server from the DNC? Rigged Investigation!” — tweet Sunday. THE FACTS: Trump’s suggestion that the investigations into Russia meddling are “phony” and have yielded nothing is incorrect. So far, four Trump associates have been charged in Mueller’s investigation, of whom three have pleaded guilty to lying to the authorities. Among them are Michael Flynn, former White House national security adviser, and Rick Gates, a former Trump campaign aide. Overall, 19 people, including 13 Russians, have been charged. Trump’s claim of “rigged” investigations that are biased and intended simply to justify “why the Dems and Crooked Hillary lost the Election” also falls short. He refers to Mueller’s team as “13 angry Democrats,” but Mueller is a Republican and some others on his team owe their jobs largely to Republican presidents. Some have indeed given money to Democratic candidates over the years. But Mueller could not have barred them from serving on that basis because regulations prohibit the consideration of political affiliation for personnel actions involving career attorneys. Mueller reports to Deputy Attorney General Rod Rosenstein, a Trump appointee. TRUMP: “This week, we passed a new landmark legislation to give more choice and better care to our great veterans. We’re going to take care of our veterans. We’re doing a great job with them. We are taking care, finally after decades, we’re taking care of our veterans.” — speech Friday. THE FACTS: Not so fast. Congress passed a wide-ranging plan last week to expand private care for veterans as an alternative to the Veterans Affairs health system, but it’ll take at least a year to implement and its actual scope in expanding choice to veterans will depend on the next VA secretary, who has yet to be confirmed. A successful expansion of private care will also depend on an overhaul of electronic health records at VA to allow for a seamless sharing of records with private physicians. That overhaul will take at least 10 years to be fully complete. The legislation would also expand a VA caregivers program to cover families of veterans of all eras, not just the families of veterans who were seriously injured in the line of duty since Sept. 11, 2001. Implementation of that program won’t begin until after the VA secretary can provide assurances to Congress that the department’s IT systems can handle a surge in new applicants. A phased rollout of benefits won’t be fully finished until more than two years afterward. TRUMP on former CIA Director John Brennan: “Brennan started this entire debacle about President Trump. We now know that Brennan had detailed knowledge of the (phony) Dossier…he knows about the Dossier, he denies knowledge of the Dossier, he briefs the Gang of 8 on the Hill about the Dossier, which…….they then used to start an investigation about Trump…” — tweets May 21. RICHARD GRENELL, Trump’s ambassador to Germany, on German Chancellor Angela Merkel never getting a tour of the private residence floor of the White House: “The president took the chancellor up to the residence with the vice president and myself and gave a personal tour of the vice president — of the residence, the presidential residence at the White House. That was the first time that the chancellor had been up there. It was shocking to hear that she had never been able to see the Lincoln Bedroom. Never been able to see the Gettysburg Address. And President Trump took her there.” — to Fox News, April 30. THE FACTS: Actually, Merkel’s office told AP this past week that she was given a tour of the private residence, including the Lincoln Bedroom, when she visited Washington in 2011 to receive the Presidential Medal of Freedom awarded to her by Obama. TRUMP, on Obama’s national intelligence director, James Clapper: “Clapper has now admitted that there was Spying in my campaign. Large dollars were paid to the Spy, far beyond normal. Starting to look like one of the biggest political scandals in U.S. history. SPYGATE – a terrible thing!” — tweet Thursday. He did not say a spy was implanted “in” the campaign and he denied the FBI was spying “on” the campaign. The effort was focused on Russians, he said, and was meant to “protect the campaign” and the U.S. political system. AP fact check: Do Trump’s recent statements on trade, guns check out?